Booklet Making: There are various methods of putting together a book. We offer Saddle Stitching, Corner Stitching, Plastic Comb, Wire-O and Perfectbinding to choose from for your project. Collating: When your project requires several sheets to be put in a specific order for handing out or inserting into a folder or binder. 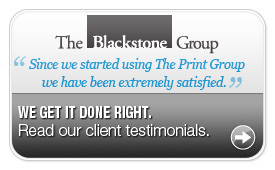 Design & Document Creation: We offer several levels of service in this area. From creating a simple form or designing a logo concept for your company. Die Cutting: When your project needs that extra visual impact. Hole Punching: From a single hole to multiple ones we can accommodate any of your needs. 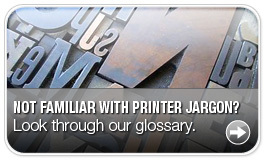 Embossing / Debossing / Foil Stamping: We can provide these specialty services. Folding: From a single fold to multiple panels, we can do it all! Scoring: With our in-house specialty scoring equipment we apply a single to multiple scores per sheet. Perforation: From a simple single line perf to a right angle configuration. Numbering: When your document or form requires a number we offer several options. UV Coating: For that professional gloss or matte finish our in house UV Coater produces professional results every time. 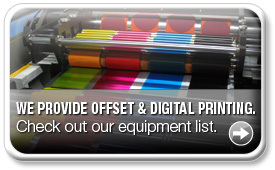 Offset Printing: From a single color to four color process (CMYK). Digital Printing: Our state-of-the-art Hp 5500 offers the latest technology for short run, four color process printing with or without variable data. Shrink Wrapping: To finish your job, we offer shrink wrapping for neater packing and handling of your final product. Lamination: To increase durability and withstand moisture as well as protect against fingerprints and smudges. Thermography: Also referred to as raised printing this offers the feel of engraving without the cost. Promotional Products: When you are looking to "get your name out" promotional products are the way. They help to generate goodwill and name recognition. High-Speed Copying: Our high-speed copiers are capable of anything from a single copy to producing a complete saddle stitched booklet.